Buy Natures Aid Pure Inulin Powder - 250grams in the UK from our online shop or directly from our independent Scottish store. 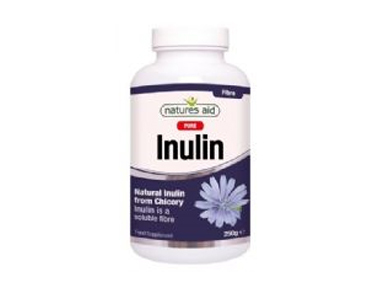 Inulin is a soluble fibre extracted from chicory root. Natures Aid Inulin is 100% natural and can be added to any food or drink. Each 5g serving provides 4.4g of fibre. Where can you buy real Pure Inulin Powder 250g safely online? If you are wondering where you can buy Natures Aid Pure Inulin Powder - 250grams safely online in the UK, then shop with us. Pure Inulin Powder 250g - Natures Aid Pure Inulin Powder - 250grams in Digestive Aids and Herbal Remedies, Tinctures & Supplements.